The Israeli army says it will forbid entry foreign visitors access to all of the the occupied territories in the West Bank, according to a June 22nd article in the Israeli newspaper Ma’ariv. Although the apparent goal for this seemingly impossible task is to keep international visitors from entering the occupied territories in support of Palestinian non-violent resistance, if it is implimented it could also stop tourists and religious pilgrims from visiting Biblical sites. “The [Israeli] army will issue a decree forbidding the entry of foreign citizens into Judea and Samaria” reads a Hebrew-only print article in Ma’ariv published on June 22nd 2006. “Judea and Samaria” is Biblical terminology for the occupied Palestinian territories in the West Bank. Tourists including Christian pilgrims may find themselves banned from many important holy, Biblical and tourist sites, such as the Christian communities in Bethlehem, Aboud and Jericho, and the Samaritan community near Nablus. 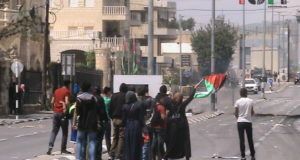 In Aboud, the shrine of St. Barbara is threatened by Israel’s wall. 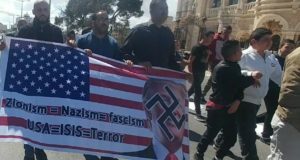 According to the article, the purpose of the ban is to “prevent the ‘Summer of Peace’ [Freedom Summer] event which is planned by the International Solidarity Movement (ISM), a pro-Palestinian organization which is active in the territories on behalf of the Palestinian population”. Through Freedom Summer, Palestinians in communities throughout the occupied territories invite internationals and Israelis to participate in non-violent demonstrations and direct actions against the annexation of Palestinian land. A similar ban has been in effect in the Gaza strip since April 2003. Very few foreign visitors have been allowed to visit Gaza. Certain journalists and workers for select international organisations have been granted time-limited permits by Israel, but even these are not easy to obtain. This ban has remained in effect after Israel’s unilateral “disengagement” from the Gaza strip. Only Palestinians with Israeli-issued ID cards are permitted to access through the Rafah crossing, even though it was supposedly transferred to Palestinian control with European observers. All other entry and exit points to the Gaza strip remain under Israeli control. 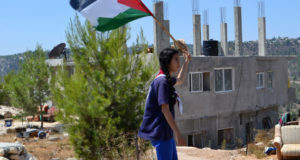 The announcement of this ban comes at a time when foreign aid workers and foreign nationals of Palestinian origin and their families are experiencing increased Israeli restrictions on their right to reside in the Occupied Palestinian Territories. A number of individuals residing for long periods in the Occupied Territories for work or family reasons who had been renewing three month Israeli visas by periodically leaving the country and returning were recently denied entry by Israeli authorities or told they will not be allowed to return.